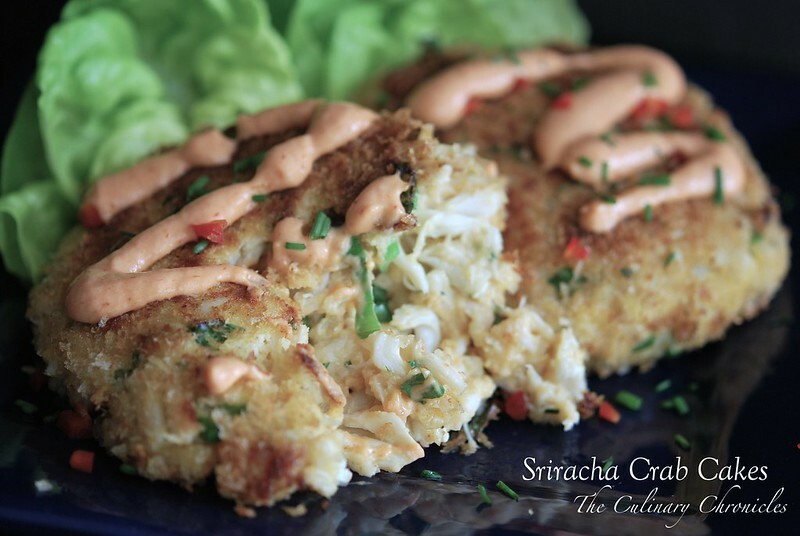 Sriracha Crab Cakes–Bringing the heat to Valentine’s Day! However, if you’re like the gazillion of other folks out there, you may be still scrambling to solidify your plans to woo your loved one. So let a sistah help you out……..skip the overpriced restaurants with the “meh” prix fixed menus and jump in the kitchen to cook a delish meal for your sweetie. But that doesn’t mean you need to slave away in the kitchen all day to impress your Boo. 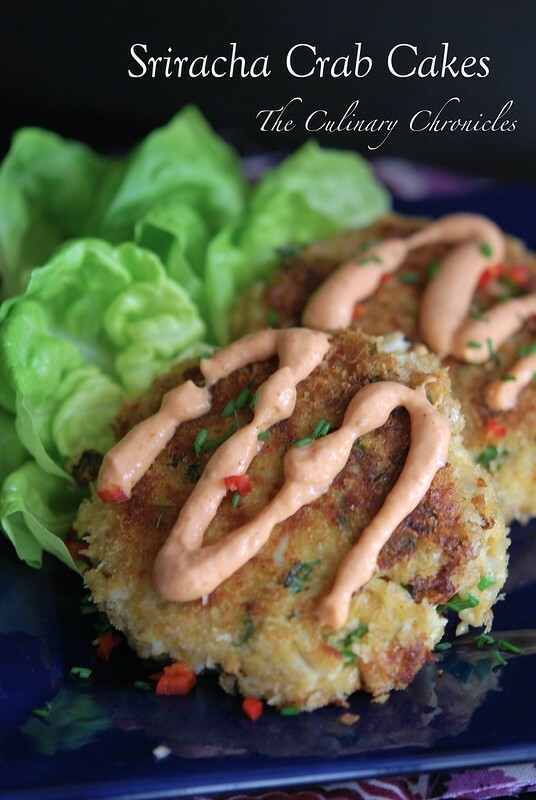 In fact, not only are these Sriracha Crab Cakes super easy to make but they are sure to BRING THE HEAT to your Valentine’s Day! 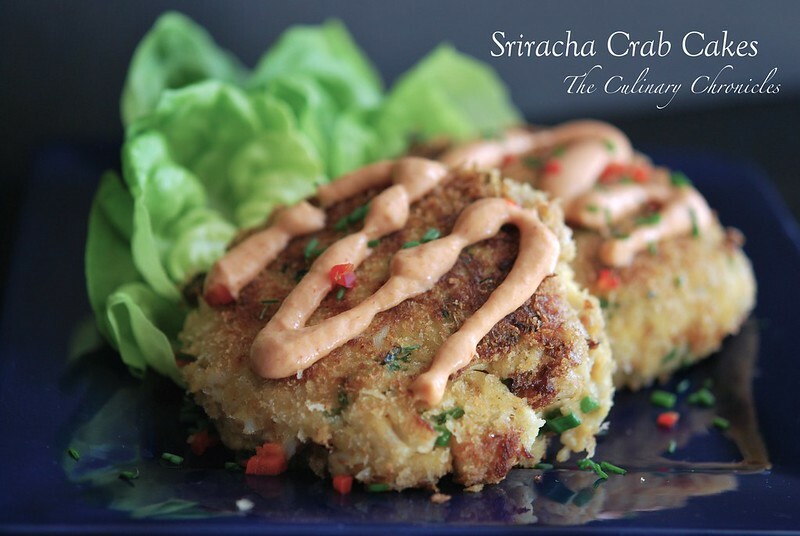 The crab cakes are jammed pack with lump crab and have a wonderful kick of heat from the Sriracha and jalapenos. Oh yea….. Pair them with a bright bottle of bubbly and chocolate covered strawberries and BOOM! Instant recipe for love. Begin preparing the crab cakes by whisking together the Sriracha, egg white, sour cream, mayonnaise, lemon juice, paprika, and garlic. Once combined, gently fold in the crab meat, jalapeno, scallions, parsley and ¼ cup of the bread crumbs. You may add additional breadcrumbs if the mixture is too wet. Season with salt and pepper to taste. Divide the mixture into fourths and form each portion into equal sized patties. Dredge the crab cakes with the remaining breadcrumbs. Cover the crab cakes and refrigerate for at least 30 minutes. Prepare the sauce by whisking together the sour cream, mayonnaise, Sriracha, cayenne and lemon juice. Add salt and pepper to taste and refrigerate for at least 10 minutes. Heat a large skillet or cast iron on medium heat. Melt the 1 tablespoon butter into 2 tablespoons oil, swirling the liquid around the skillet. In batches, fry two of the crab cakes for 3-4 minutes on each side, until they are golden brown and heated through. Remove the crab cakes and wipe the skillet with a paper towel before adding the remaining butter and oil. Fry the remaining two crab cakes. To plate, drizzle some of the sauce of each over each of the crab cakes and sprinkle additional chives and minced jalapeno over the top. Serve with additional lemon wedges. Next Post Parisian Macarons with Chocolate Ganache…ooh la, la! yum yum give me some! ok. a lot. give me a lot pls. looks Delicious! you gotta gimme some pointers on how you take your pics, their as appetizing as the food is! I have all of the ingredients for the sauce, I just need the ingredients for the crab cakes now. They look so tasty even at 9:00 in the morning before even having my coffee!